OMTEX CLASSES: Ashok and Tanaji are Partners sharing Profits and Losses in the ratio 2:3 respectively. Ashok and Tanaji are Partners sharing Profits and Losses in the ratio 2:3 respectively. Closing stock is valued at the Cost of Rs.15,000 while its Market Price Rs.18,000. 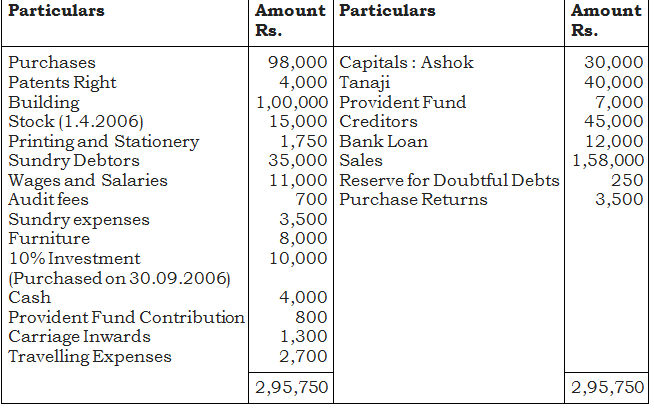 On 31st March, 2007 the stock of stationery was Rs.500. Provide reserve for bad and doubtful debts at 5% on debtors. Depreciate building at 5% and patent rights at 10%. Interest on capitals is to be provided at 5% p.a. Goods worth Rs.10,000 were destroyed by fire. The Insurance company admitted a claim for Rs.8,000.